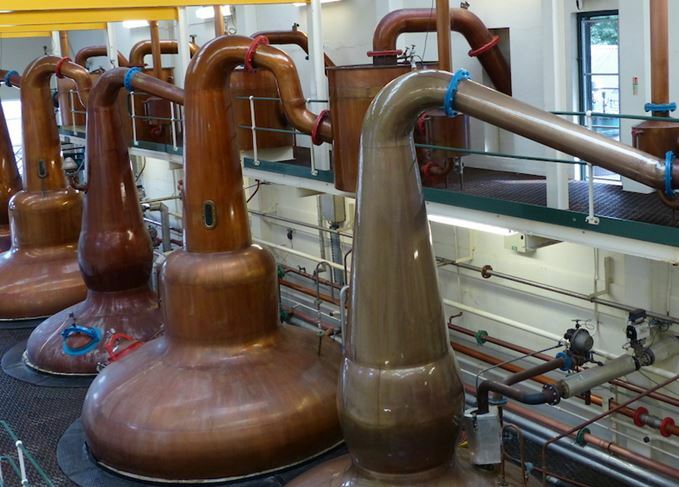 The head of a pot still is connected to the condensing system by a simple copper pipe called a lyne arm or lye pipe. But this insignificant-looking tube can have quite an influence on the flavour and style of the spirit, as the Whisky Professor explains. While browsing in my local whisky shop the other day (and operating on a tight budget), I chanced upon a bottle of Glen Keith Distillery Edition at a tempting price, and thought I’d give it a go. It’s a soft and light malt – gentle and undemanding, to my mind – and I was interested to hear from the shopkeeper that one of the reasons for this style is the angle of its lyne arm (the term, I was told, for the pipe that runs off the top of the still). There wasn’t time to go into much more detail, so it set me wondering: why is the angle of the lyne arm so important? And what impact can it have on spirit character and flavour? Thank you for your excellent question. This is one of those subjects that appears, on first inspection, to be a relatively simple matter. Then you delve more deeply into it and, well, things become rather more complicated. As you rightly say, the lyne arm – or lye pipe, to give it its other common name – links the head of the still to the condensing system, most commonly a modern shell-and-tube construction, but sometimes the more traditional worm tub. As so often happens in the alchemy of whisky distillation, a stage of the process which began in simple functionality has become another means of refinement – one more step on the road to acquiring the desired style and character of spirit. Let’s start with the basics. In its simplest form, the lyne arm is a cylindrical copper tube that, as it leaves the head of the still, either (a) angles upwards; (b) is horizontal; or (c) angles downwards. With (a), the steeper the upward angle, the more reflux is created – in other words, the more the spirit vapours that condense on the inside of the pipe will trickle back down into the body of the still again. This will help to create a lighter spirit. But, in the case of (c), the downward angle of the pipe reduces reflux and instead encourages ‘carryover’, where more of the heavy oils trickle down towards the condenser. This will help create a heavier, sometimes nutty spirit. That’s the easy bit, and it applies to a number of distilleries, including Glen Keith. Its upwardly angled lyne arms have been likened by one whisky writer to ‘elephants’ trunks testing the air’, and they do indeed help to create that light style of spirit. The same logic applies to, for instance, Allt-A-Bhainne and Glencadam: upwardly-angled lyne arms; delicacy and lightness. But fashions change – and the demands of blenders sometimes dictate that adjustments have to be made in order to achieve a different style of spirit. In particular, the fashion for lighter character at the end of the 19th century, and again in the mid-20th century, led to some tweaks to this deceptively simple little pipe. Walk into the still house at Glen Grant. Eight huge stills, and the lyne arms have a noticeable downward incline. But what’s this? Instead of heading straight to the condensers, they’re directed into small copper drums. Purifiers. These are cooling devices, designed to try to persuade some of the heavier compounds to condense and return to the body of the still. Suddenly, a potentially heavier spirit has become much lighter. It’s a canny tactic, and one that – when brought to bear on a relatively grassy style, as at Strathmill or Glenlossie – can produce a distinctive oily texture in the new make spirit. ‘My theory – which didn’t go down well with the marketing department – was that, when they were starting up Ardbeg, the whisky was probably crap, so they decided to put an angle on the lyne arm. ‘And it was probably still no good, so they put in the purifier, collecting any liquid and directing it back into the body of the still, allowing it to run back down, but not stopping the vapours from heading up the still.’ QED. Lyne arms also have a frustrating habit of not moving in a straight line. At Macduff, you’ll find them heading slightly up and then pulling a sharp right turn; Tobermory’s have an S-bend at the top (another way of promoting reflux); Talisker combines a big U-bend with a purifier pipe. But, taken in isolation, these details are just one chapter in a long story. They may influence spirit character, but they do not define it. After that U-bend, Talisker’s lyne arm moves back up again before plunging into cold worm tubs, counteracting the sweet oiliness of reflux with the sulphurous compounds encouraged by the tubs. Then there’s Cragganmore. Lyne arms heading down from its wash stills into cold worms? Heavy spirit character. But those wash stills are big, promoting lightness. The spirit stills? Small, but flat-topped (so more reflux); offset lyne arm with a long, shallow decline. Reflux again. And the overall effect? Complexity, versatility, an instrument on which the distiller can play a number of tunes. Lyne arms are an important detail in the picture of making malt whisky, but they’re just that: a detail. There’s a heck of a lot more going on in the distillery, both because of the equipment and because of the human beings who operate it. I hope that goes some way to answering your question. Where did the term ‘lyne arm’ come from? The Prof takes a break from science to consider the etymology of the lyne arm. How does a solera mature whisky? Who better to disentangle the complex concept of solera systems than our resident Whisky Professor? Whisky or whiskey: why the two spellings? The Whisky Professor explains why the spelling of ‘whisky’ or ‘whiskey’ differs between countries. Why is Scotch whisky bottled at 40% abv? Unpicking the political and historical reasons for Scotch’s minimum alcoholic strength.